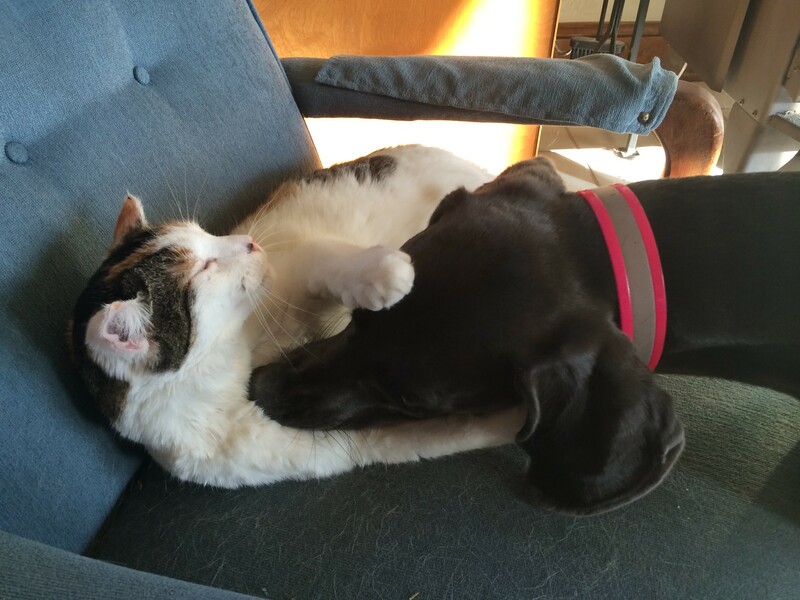 Posted on March 25, 2014, in Cats and your Weim, Hot Topics, Information and Education, Maggie X Benton, Previous Pup Update, The Weimaraner and tagged Blue Weim and Cat, Blue Weimaraner, Boise area Weimaraner, Cats and the Weimaraner, Ellie, relationship. Bookmark the permalink. 2 Comments. It’s great to see Ellie and Sofie :o) I’m afraid Easy and a cat would end in a CATastrophe. It might well end in a CATastrophe. This Weim was younger (but not a tiny pup) when they got her. It was a win-win situation, because then they could get moving forward quickly with their agenda. Regardless, she was young, and the cat was a resident cat at the home when she arrived. We told them we could not promise anything. In the end, it went better than anyone could imagine. We still believe a person must approach bringing in a cat (once the Weim is established in the house–or, when you are bringing a rehomed Weim) with caution. Much of what would happen would depend upon getting a lot of the introduction accomplished in good order, and having safe areas for the cat. Nonetheless, I am wary of the two situations I mention here; prey drive is resident in the Weim. If they happen to vie the cat as prey (or are triggered by their get-away) the chase could be on. It could end badly, and that scenario is always best to avoid.